I returned to Washington, DC from Guantanamo Bay on Saturday the 10th of September, and am going back to Guantanamo on Monday the 12th. 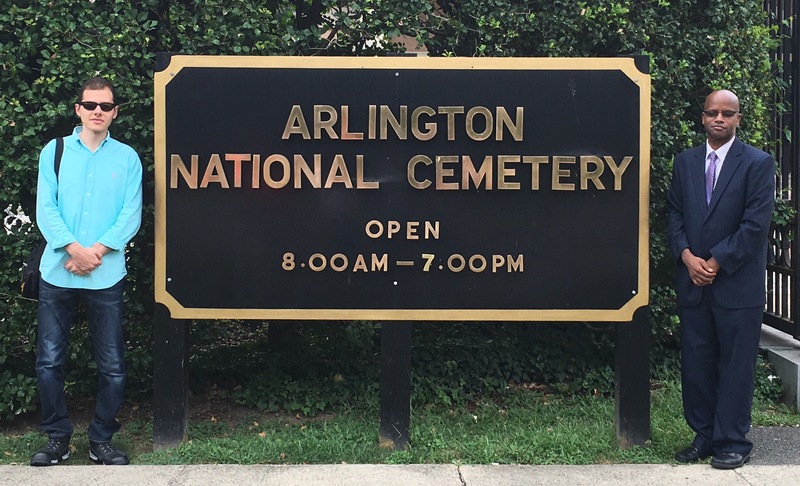 On Sunday, the 15th Anniversary of the World Trade Center and Oentagon attacks, my law student Faisel Sadat and I paid respects at Arlington Cemetery. Last week I was there for pretrial hearings in the U.S. Military case against all Nashiri, who allegedly masterminded the 2000 bombing of the USS Cole off the coast of Yemen, killing 17 US sailors. This week I am monitoring the modification of the guilty plead for Majid Khan, who is the only person convicted of crimes among the 61 men being held at the Guantanamo prison. I am joined by 6 non-governmental organization (NGO) representatives (pictured above), including one who was with me last week. We are expected to have only one hour of court this week, on Wednesday. 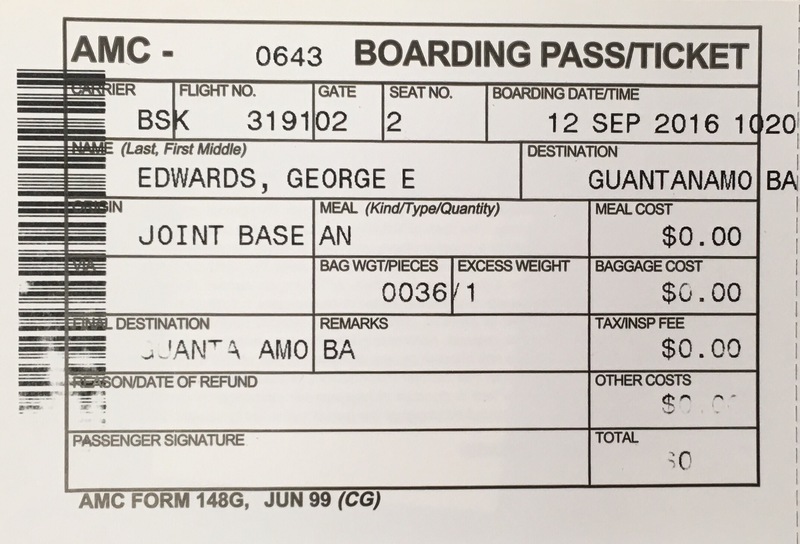 Non-governmental organizations (NGOs) fly to Guantanamo Bay, Cuba for ringside seats at U.S. Military Commission war crimes proceedings. NGOs, which tend to focus on human rights issues, attend, observe, analyze, critique and report on what they see and hear at Guantanamo. NGOs are windows to the outside world for people without Guantanamo access. For the first time in recent memory, this week NGOs at Guantanamo had separate briefings by each of the three sets of lawyers involved with a pending case against a particular defendant. The 9 NGO representatives present were briefed by: (a) the Chief Prosecutor; (b) the Chief Defense Lawyer; and (c) the military and civilian lawyers for al Nashiri, who is accused of masterminding the 2000 bombing of the U.S.S. Cole off the coast of Yemen, killing 17 U.S. sailors and wounding dozens. The NGOs were at Guantanamo for a week of pre-trial hearings in the case of al Nashiri, who faces the death penalty. The first lawyers’ briefing of the week was by Chief Prosecutor Brigadier General Mark Martins, who is responsible for the prosecution of any and all Guantanamo Bay detainees. He is formally part of the prosecution team against all defendants, including al Nashiri, and he actively participated at the prosecution table in this week’s hearings. The next lawyers’ briefing was by Chief Defense Counsel Brigadier General John Baker, joined by Deputy Chief Defense Counsel Captain Brent Filbert. General Baker is responsible for all defense counsel on all Guantanamo cases, and is not part of the al Nashiri defense team or of any other defense team. Neither he nor Captain Filbert has an attorney client privilege with any detainee. The final lawyers’ briefing was by civilian and military attorneys for al Nashiri. These were civilian lead counsel (Learned Counsel Rick Kammen) and military co-counsel (Lt. Commander Jennifer Pollio). NGOs with al Nashiri’s Learned Counsel Rick Kammen and military co-counsel Lt. Commander Jennifer Pollio. These briefings offered the 9 NGOs insights into a range of perspectives on Guantanamo law and practice. The NGOs on this mission, who agreed that these briefings were insightful and very helpful, expressed hope that the NGO briefings would continue when future NGO representatives travel to Guantanamo for future hearings. Predictably, the three briefings focused on similar issues. Military Commission fairness (or not). Compliance with U.S. and international law (or not). Transparency of the process (or not). Rights afforded to all stakeholders (or not). Comparisons among U.S. federal criminal law and criminal procedure, the Uniform Code of Military Justice (UCMJ), and the Military Commission substantive and procedural statute, regulations and rules (favorable / unfavorable comparisons). The lawyers expressed different perspectives on the pace of the proceedings, to whom delays should be attributable, and logistical and other issues regarding trials at Guantanamo Bay versus on the U.S. mainland. They also shared on more personal issues, such as their careers and families, and possibilities for life for the lawyers after Guantanamo. And yes, the topics of Guantanamo iguanas, banana rats, gnats and mosquitos came up. None of the briefings was on the record, and of course none included any classified information. All the briefings helped NGOs understand critically important matters related to the case at bar – against al Nashiri – and about larger Guantanamo-related issues. Each of the briefings differed from the others. Each lawyer had a unique personal style, had particular messages they apparently wanted to convey, and used different means to communicate with the NGOS — including visual aids. Briefing tools used during the week included (without disclosing which lawyers used which briefing tools! ): CDs that contain papers for motions on the week’s docket; basic Military Commission instruments and other information projected onto a screen and a staffer to navigate such; CD readers for NGOs whose new generation laptops lack CD drives; prepared remarks; a scribe to record briefing notes; e-mail addresses and invitations for further NGO communication; a follow-up invitation to a bar-b-que (that served Subway sandwiches! ); and a staffer who served as photographer for group and individual shots of the lawyers and the NGO representatives. NGOs huddled during the week seeking to think of ways that the lawyers might further enhance the NGO experiences. Among the NGO suggestions were for the lawyers to provide NGOs — before the NGOs depart for Guantanamo Bay — a short summary of the week’s expected motions, the statutory and other information on the CD that was provided, statements / remarks to be presented by the lawyers to the media (if available), and confirmation that the briefing will take place (to prevent NGOs from having to inquire as to whether a particular briefing will occur). Some of the NGOs wondered about the venues of the different briefings, and who decided which briefings were held in which venue. Venue 1: The Media Operations Center (MOC), in a room with cushioned chairs, a blue velvet stage curtain, high tech audio / visual equipment, and parasol shades for camera lighting. Venue 2: The NGO Resource Center, barren, with the lawyers sitting on folding card-table chairs. The NGOs unanimously agreed that the NGO briefings by all sets of lawyers were very helpful to the NGOs as they seek to fulfill their remit of attending, observing, analyzing, critiquing and reporting on the U.S. Military Commissions. If NGOs are to be the eyes and ears to the outside world, they should be able to see and hear from the lawyers who are most intimately involved with the Guantanamo Bay cases. The NGOs all hope that briefings by all sets of lawyers will become routine at Guantanamo Bay during weeks when hearings or trials are held. Full NGO briefings by Guantanamo Bay lawyers promote transparency, human rights, and the rule of law. The sun rises this morning at Andrews Air Force Base as we gather to fly to Guantanamo Bay. 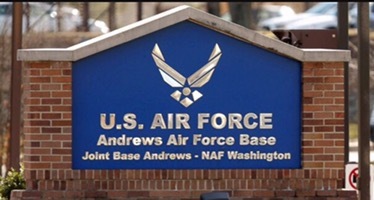 I’m at Andrews Air Force Base again, at sunrise, heading for Guantánamo Bay, Cuba. This time I’m scheduled to attend hearings in the US military commission case against al Nashiri, who it is alleged to have masterminded the 2000 bombing of the USS Cole off the coast of Yemen, killing 17 US sailors. I’m to monitor the proceedings from an international law perspective. al Nashiri has not had a hearing in 18 months. The court sessions were stayed for this period, during which time conflict and controversy has not ceased. The 3 days of hearings this week, if they go forward, may cover dozens of substantive issues the military judge listed on a scheduling order filed in August. It is not clear how much can be accomplished in 3 days. History has shown that during hearing weeks, often there is very little court time. Issues have often arisen, detailing hearings. Some pre-trial issues in the pasta have related to his treatment while in CIA black sites beginning in 2002 for 4 years, where the Senate Torture Report and other sources (including al Nashiri himself) have identified the following practices against al Nashiri – waterboarding (admitted by the government), mock executions, stress positions, and threats of sexual violence against his mother. Another issue is the length of time between 2002 when he was arrested and now, 14 years later, without his trial beginning. Numerous other issues, some pending before or decided by the military commission or by other courts, appear to stand in the way of a firm trial date in the foreseeable future. Today 9 non-governmental Organization representatives are set to travel to Guantánamo, to monitor this weeks hearings. I am representing the US Military Commission Observation Project (MCOP) which is part of the Program in International Human Rights Law of the Indiana University McKinney school of Law. We have been sending IU McKinney faculty, staff, students, and graduates to Guantánamo Bay to monitor hearings in these poor crimes trials. Our Indiana mission includes to attend, observe, analyze, critique and report on these proceedings. We hope to promote transparency, in line with the Pentagon’s stated goal of transparency for these proceedings. We also seek to shed light on the internationally recognized human rights that should be afforded to all stakeholders in these proceedings. Stakeholders include the defendants, who have rights and interests. Stakeholders also include the prosecution, victims and victims’ families, the media, the monitors, the military charged with operating the detention center, and many other individuals and groups. We are producing the Guantanamo Bay Fair Trial Manual, which explores the full range of Guantanamo stakeholders’ rights and interests. A U.S. Military Commission at Guantanamo Bay, Cuba has scheduled pre-trial hearings next week in the case against Abd al-Rahim al-Nashiri, who allegedly masterminded the 2000 USS Cole bombing that killed 17 U.S. sailors off the coast of Yemen. At pre-trial hearings defense and prosecution lawyers routinely debate evidentiary, jurisdictional, logistical and other issues, and deal with matters such as what evidence will be admissible at trial, which witnesses will be called and when, whether the court possesses jurisdiction to hear the case, and what date to set for the trial to commence. What is typical (or atypical) about the al Nashiri pre-trial hearings, about his case itself, or about his plight before other tribunals that have or could exercise jurisdiction? Is his case more complex than others? Multiple courts have either resolved issues related to charges against al Nashiri or have sought to resolve such issue, or to exercise such jurisdiction. These proceedings appear to have extended beyond routine evidentiary, jurisdictional or logistical issues. Though the military commission judge identified issues to be debated next week (see his 12 August 2016 docketing order below), it is unclear what will be heard. Indeed it is unclear whether the hearings will go forward. al Nashiri hearings were stayed for almost a year, and when they were set to resume in April, they were abruptly postponed until now. 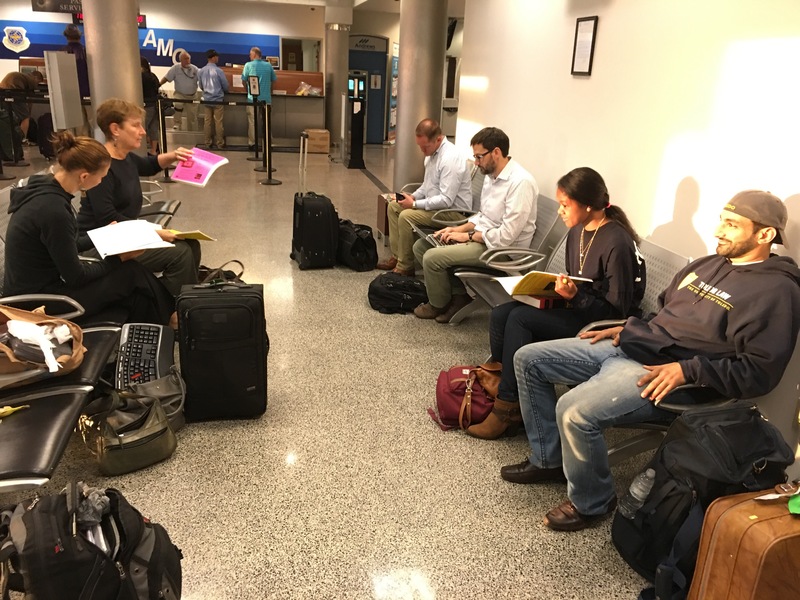 Though many dozens of us are gathered in Washington, DC for a post-Labor Day flight from Andrews Air Force Base to Guantanamo, the hearings can be cancelled at any moment, even after we touch down at Guantanamo Tuesday afternoon. The stakes are high, as proceedings in different courts could result in one, more or all the charges against al Nashiri being permanently dismissed. al-Nashiri is charged with multiple war crimes, including perfidy, murder in violation of the law of war, attempted murder in violation of the law of war, attacking civilians, and attacking civilian objects. He faces the death penalty. Several courts have exercised or sought to exercise jurisdiction over al Nashiri, that is, the courts have or have sought to resolve matters related to his detention or his alleged crimes. First is the military commission itself at Guantanamo Bay. al Nashiri was picked up in 2002, held in secret CIA camps for about 4 years, taken to Guantanamo Bay in 2006, and arraigned in 2001 in a military commission. In that commission, he is charged with war crimes associated with the U.S.S. Cole and other ships. This commission is the primary court exercising jurisdiction over al Nashiri. The D.C. Circuit Court of Appeals has also exercised jurisdiction, ruling on 30 August 2016 that it would not halt the Guantanamo commission against him. The defense had asked the appeals court stop the commission because the commission was not lawfully able to exercise jurisdiction. The appeals court chose not to decide the merits of the matter unless al Nashiri is convicted, at which time the appeals court would decide whether the commission had conducted a trial without jurisdiction. The Court of Military Commissions Review (CMCR) issued a ruling in his Military Commission case in June 2016, and one in July. The U.S. District Court for the Southern District of New York also has had a stake, as al Nashiri was indicted in that district but the case has not moved forward because Congress prohibited moving detainees to the U.S. for trial. The European Court of Human Rights ruled that the government of Poland breached international human rights law when it permitted the U.S. to detain al Nashiri on Polish soil, where he was tortured. The court ordered Poland to pay al Nashiri over $250,000. At the pre-trial hearings this week, the issue of jurisdiction will certainly arise. al Nashiri’s pre-trial hearings have touched on many issues. Front and center recently have been jurisdictional issues, such as those discussed above handled by the DC Circuit and the CMCR, and also raised in the commissions. 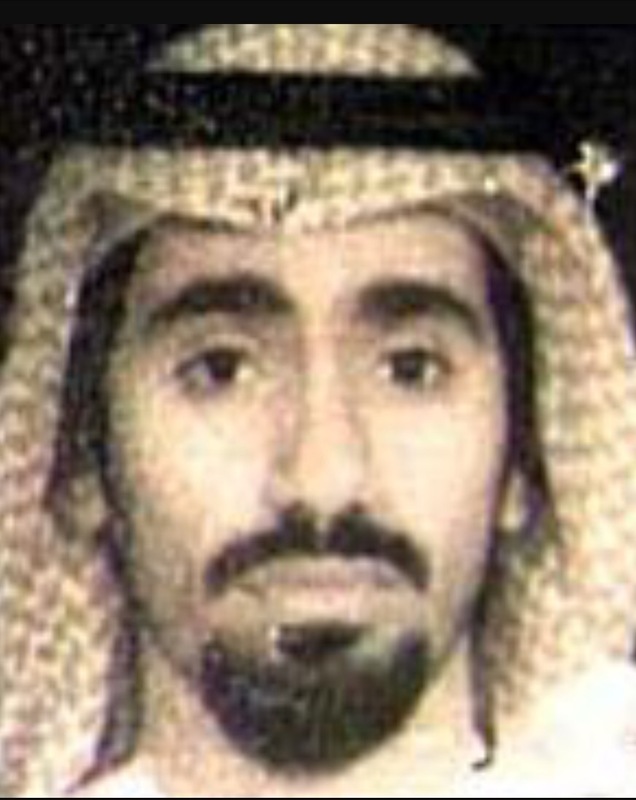 Pre-trial issues have related to his treatment while in CIA black sites beginning in 2002 for 4 years, where the Senate Torture Report and other sources (including al Nashiri himself) have identified the following practices against al Nashiri – waterboarding (admitted by the government), mock executions, stress positions, and threats of sexual violence against his mother. Should a person be tried on criminal charges after being subjected to this treatment? Can any statements made by al Nashiri after such treatment be allowed as evidence in the trial against him? al Nashiri’s physical and mental health. Much remains to be resolved before any actual trial is held. This will be my fourth visit to Cuba in as many months, with three visits to Guantanamo Bay and one to Havana. My first visit to Guantanamo Bay in this cycle was to monitor U.S. Military Commission pre-trial hearings in the case against Hadi al Iraqi, who is alleged to have been a high-ranking al Qaeda Iraq member, and to have liaised between al Qaeda Iraq and the Taliban. Hs is charged with various war crimes. My Hadi al Iraqi monitoring mission was through the Military Commission Observation Project of the Program in International Human Rights Law of Indiana University McKinney School of Law. Our project seeks to attend, observe, analyze, critique and report on U.S. Military Commissions. We are producing the Guantanamo Bay Fair Trial Manual, which is used and usable by any person interested in assessing whether the rights and interests of all military commission stakeholders are being afforded to them. We are interested in the rights of the defendants. We are also interested in the rights and interests of the prosecution, the victims and their families, the media, the guards and other prison personnel, witnesses, and others. On my second trip to Cuba this summer I was part of a delegation from the National Bar Association (NBA), which is the organization principally for African American lawyers, judges, law professors, and other legal professionals. An NBA conference was held jointly with the Cuban bar association, focusing on a wide range of U.S. interests and Cuban interests, and interests affecting both countries. The topic of Guantanamo Bay came up repeatedly in our discussions with Cuban judges, lawyers and law professors. I also gave a lecture at the U.S. Embassy – Havana. My third trip to Cuba this summer was in August for a Guantanamo media tour. When I arrived on Guantanamo at noon on Saturday, 13 August 2016, 76 detainees were imprisoned there. When I left Guantanamo at noon the next day, Sunday the 14th, only 61 detainees remained. During the darkness of night, 15 detainees were released to the United Arab Emirates (UAE). That resettlement marked a 20% drop in the Guantanamo Bay detention population over night. NBA law professors at Cuban lawyers collective. Writing projects of mine I was researching at Guantanamo on that third trip include The Guantanamo Bay Reader and a contributions to The Indiana Lawyer. This fourth trip to Cuba is to monitor the al Nashiri hearings pursuant to our Indiana McKinney School of Law observation program. More about all of the above (and below) is available on http://www.GitmoObserver.com. The Military Judge in the al Nashiri case on 12 August 2016 issues a Revised Docketing order, outlining the proposed program for the 3 days of scheduled hearings this week (7 – 9 September 2016). Here is that order.